Not much is known about these buttons, and they sure are one of the oddball sets for collectors to put together. They are official licensed by MLB and came (2) per pack. They were made in Vincentown, NJ and cost very little. Dykstra has had his share of legal problems over the years. He was recently sentenced to three years in prison for grand theft auto. His financial adviser business went under and he is bankrupt. 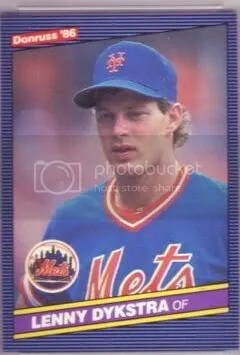 Dykstra made millions, and now has nothing. I don’t know what goes through some of these people’s heads after they get all that money.